Sidney and Gertrude Zack Gallery - JCC, 950 W. 41st Avenue, Vancouver. 7:30 Rabbi Carey Brown of Temple Sholom joins the artist for an “Artist’s Beit Midrash” roundtable discussion of Lashon Hara. Atlas is a mixed-media artist working in the genre of visual Midrash. (evil speech; creating darkness) on the spiritual realm and the physical universe. The exhibit’s interactive component welcomes the public to acknowledge lashon hara in their own lives via notes written and then posted on the wall that will reveal the viewers’ own personal experience of creating darkness through speaking evil. At the end of the exhibit these slips of paper will be turned into mulch for the ritual planting of a tree at the JCC. In this way we will symbolically take darkness and turn it into light. Robin's work has been shown in venues throughout the United States and we are pleased to welcome her to the Zack Gallery. 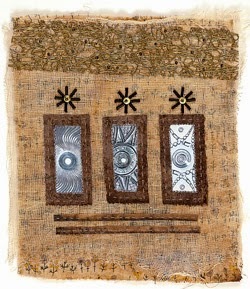 Image above: Robin Atlas Bfnei Shlosha 2012, mixed media on fabric 13”x 13”.